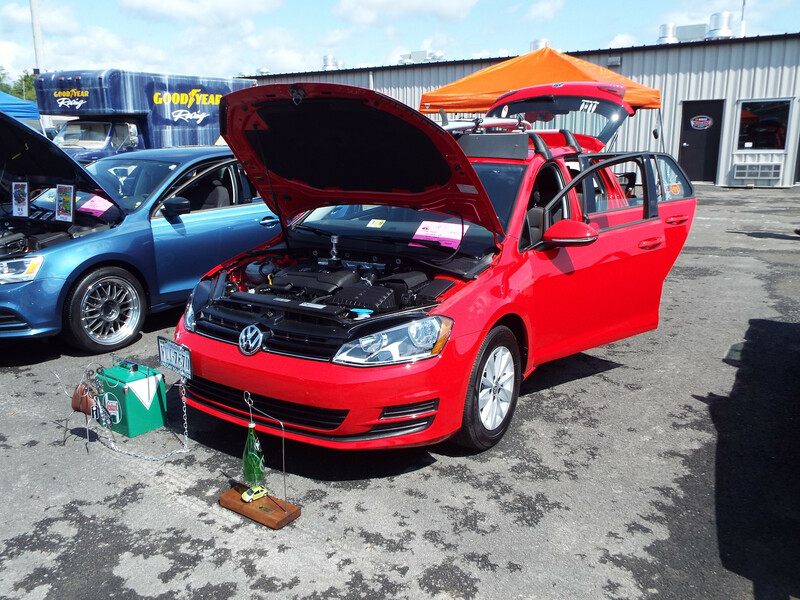 It had been ten years since the last time I attended a Volkswagen car show. 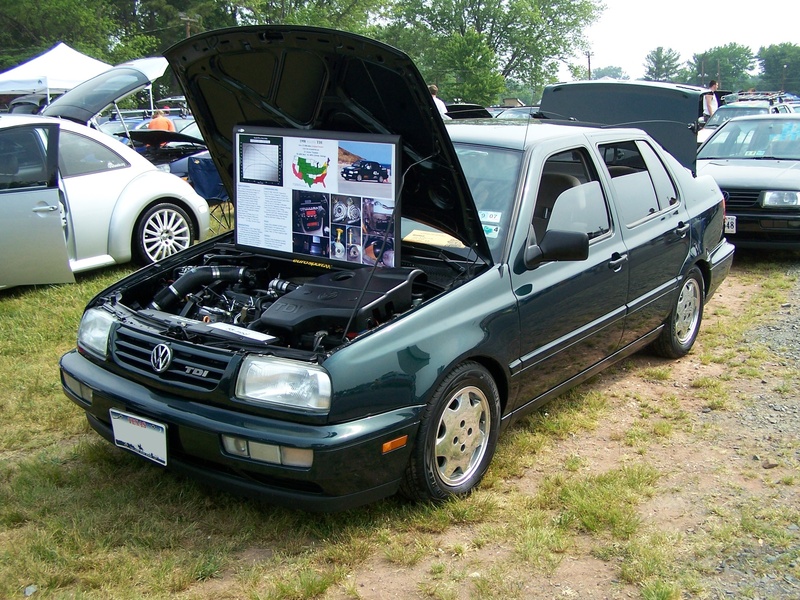 The TDIFests in 2009 and 2011 are noteworthy exceptions, but they cater only to the TDI crowd. “BugOut” is for all Volkswagens and has a long history that likely started when only classic, air-cooled Volkswagens were featured. BugOut may have been among the first of VW shows to unify the air-cooled and water-cooled scenes. 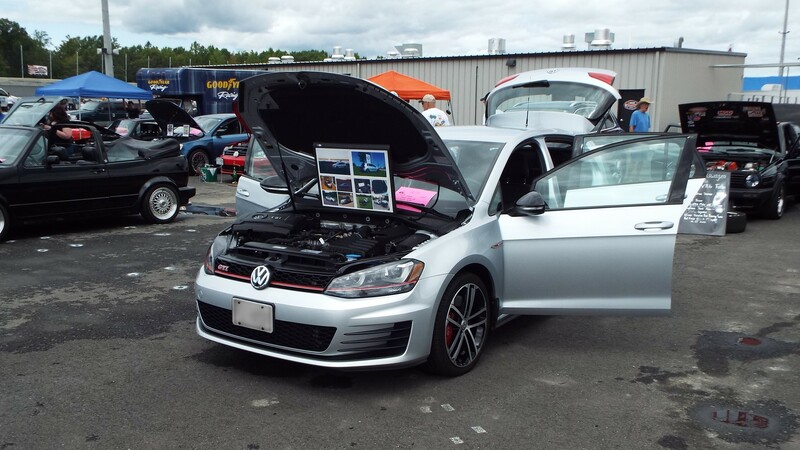 Somehow, attending VW shows became stale for me after years of regular attendance. I was autocrossing or bicycling most weekends, so I had plenty to occupy my time. Still, I’ve had an urge to go back. BugOut is relatively close to home, so it’s an obvious choice for me to attend. This car has shown and/or placed at various shows in TX, AZ, MA, VA, PA, MD, and KY.
“BugOut 34” in Dinwiddie, VA in 1996 was my first taste of VW showcars and VW drag racing. 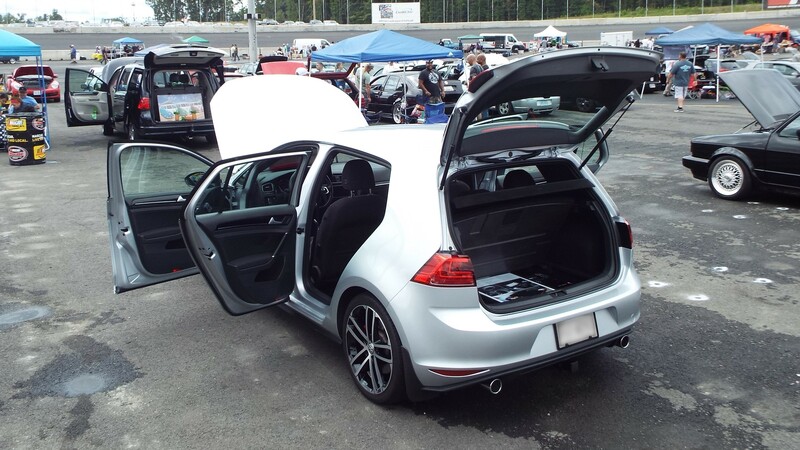 Years passed before I attended another VW show. I joined a VW club in 1999 and kept in touch through their website (I was isolated from VW enthusiasts at the time). Eventually, I decided to meet them at a show near Dallas, TX. I entered my car to show for a few reasons: 1) to support the event, 2) to get a great parking space, and 3) the periodic detailed cleaning is great for the car. I entered my car in the stock show class since it had no noticeable modifications. Little did I know that I was a contender; the name of the game when showing a stock car is to make sure it is clean, CLEAN, CLEAN. Mine was clean enough to take the class win. Not bad for having driven over 700-miles to attend the show. My competitors all had fancy displays; I had just the car. I eventually added displays over the years, as shown in this photo from BugOut 61. Fast-forward to BugOut 80: My display was slightly more than just my new car, but still very modest when compared to the competition. I had forgotten how much work it is to show a car! Some might say, “It’s 2017 and your car is a 2017… How hard can it be?” My car has over 28,000 daily-driven miles on it, including a winter with a few snow days and salted roads. Sure, I wash the car regularly and have even waxed it once. But car shows are for cleaning every nook at cranny, places on the car that most never think about, but stand out at a show. On modern VWs, that includes plenty of little “boxes” in the engine bay that catch tiny pieces of debris. It’s tough to explain in writing, but you see the difference between one that is clean and one that’s not clean at a show. Fully-preparing a daily driver for a show is time-consuming. I didn’t talk with as many people as I could have or should have. I was focused on re-cleaning the car when I arrived, then I was beat from all the leaning and squatting. Because of my somewhat minimalist approach to the show, I didn’t pack any chairs or shelter; nor did I think to bring a cooler (rookie mistake). It wasn’t terribly hot, but I still found myself frequenting the concession stand for water. I took cover in a few shaded areas to relax, but it would have been way better if I had brought a chair and some shade. I’ll be more prepared next time. I did talk to a few folks, so I wasn’t a total hermit. 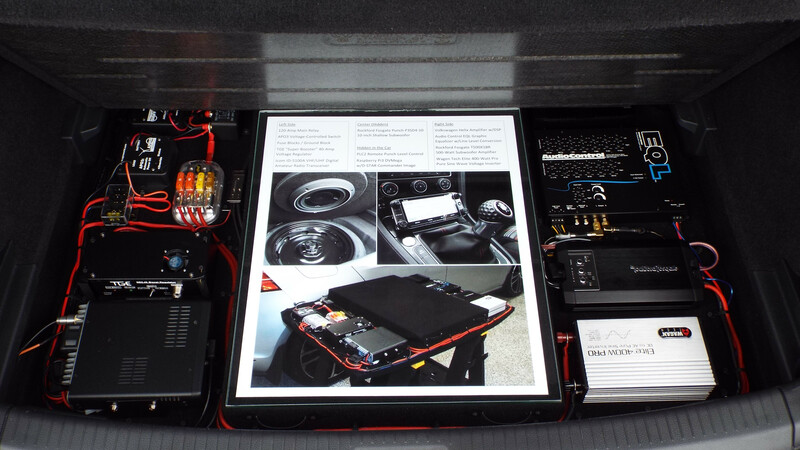 😉 An electronics engineer who liked my trunk display started a discussion about how far communications equipment has come in 30-40 years. I also talked with the driver of my car’s identical (but modified) “twin” and a Facebook acquaintance who lives near me (red Golf R). I’ve shared some photos below, starting with shots of my car, followed by the rest in the order in which I walked the field. Does this show have most V W model’s from the 1960 ‘s on up to 2016? Are there any V W’s for sale at these shows?